MERMAID LACE AND TULLE WEDDING GOWN WITH SHEER V-NECKLINE AND DETATCHABLE BELT. THE BRIDAL DRESS HAS A CHAPEL LENGHT TRAIN. THE BACK OF THIS ELLEGANT WEDDING GOWN IS A BUTTON AND LACE-UP COMBINATION AVAILABLE AT YORDAY BRIDAL. WEDDING GOWN APPOINTMENTS CAN BE MADE AT YOURDAY BRIDAL STUDIO - DIRECTIONS AT CONTACT US ON THE WEB. 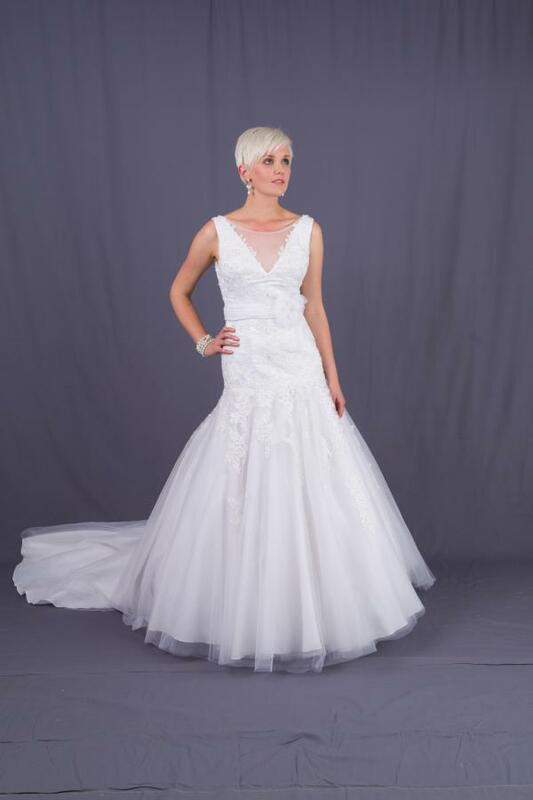 CENTURION BRANCH CELL 073 299 2028 OR 012 653 0318, 104 WILLEM BOTHA STREET, ELDORAIGNE centurion@yourdaybridal.co.za CLOSE TO CENTURION MALL AND MALL@REDS. 30 MIN FROM MONTANA, ANNLIN, PRETORIA EAST, MENLYN, BROOKLYN, LYNNWOOD.